Summertime goes hand in hand with wedding season. The flowers, the food, music and dresses. And what better job to have than that of a wedding planner. Ivy Rhodes is the wedding planner to have, she doesn't crack under pressure and actually manages to begin weddings on time. She plans for everything, even love...though the love that finds her still manages to surprise her. Ivy meets Ben in true wedding blooper fashion. And the fun doesn't stop there. You get to follow along with Ben as he films the numerous crazy things that happen to Ivy at weddings. For Ivy the idea of revealing the behind the scenes workings on national tv is nerve wracking, but not more than the fact that it is Ben behind the camera. You will be pulled into Ben and Ivy's story from the beginning. From their hot passion filled night to the surprised anger at having to work together. You will want to believe in love as strongly as Ivy does, and you will keep hoping that Ben can learn how to accept her view as well. 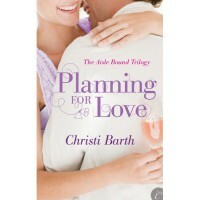 Christi Barth has written another fun summer hit with Planning For Love. Fun characters, great story line, and a perfect happily ever after. It is a book about weddings after all, you need a great HEA.